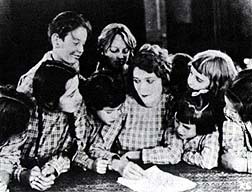 Cast: Mary Pickford (Judy Abbott), Milla Davenport (Mrs. Lippett), Percy Haswell (Miss Pritchard), Fay Lemport (Angelina Wykoff), Mahlon Hamilton (Jarvis Pendleton), Lillian Langdon (Mrs. Pendleton), Betty Bouton (Julia Pendleton), Audrey Chapman (Sallie McBride), Marshall Neilan (Jimmie McBride), Carrie Clark Ward (Mrs. Semple), Wesley Barry (Orphan Boy). "Daddy Long Legs" is one of the purest delights of silent cinema, and yet another testament to the genius of Mary Pickford -- obscured for so long by the general unavailability of her films, but in process of revelation in detail through the ongoing releases of the Pickford Foundation. 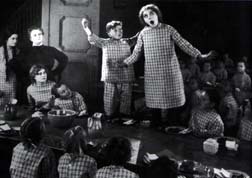 "Daddy Long Legs" is a Dickensian melodrama about a girl, Jerusha (Judy) Abbott, raised in an orphanage who's sent to college eventually by a mysterious benefactor. Through a series of circumstances too outlandish to bear much scrutiny, she falls in love with an older man much above her station in life, whose nephew falls in love with her, and becomes a famous novelist. A final encounter with the shadowy benefactor turns her life upside down one last time. A plot like this could have been treated seriously and ponderously in the silent era but Marshall Neilan, Pickford's favorite director, gives it his customary touch of whimsey, lighthearted sentiment and goofy comedy, and creates a perfect frame for Pickford's art. Pickford turns in a bona fide tour de force in "Daddy Long-Legs" -- it's almost a primer in silent film acting. She starts out as a twelve year-old and pulls it off without a trace of self-consciousness. It's a stylized characterization but nuanced, complicated and utterly good-natured - in line with the tone of the whole film. The physical comedy is so simple and delightful and perfectly realized that you simply don't care how old Pickford is - you're too preoccupied with watching her every move, and too busy falling in love with the character she's playing. Then there's a jump in time, and suddenly that character is a young woman and you know it instantly, just by the way she holds herself now, a bit more quiet in her carriage, with a hint of weariness and sadness, too. You feel the passing years in your gut. The wonderful thing about the performance as a whole is that you see the young lady in Judy the child, and you see Judy the child in the young lady. There's a carefully calculated continuity in the physical being Pickford creates, but it doesn't draw attention to itself, as so many star turns like this do. There's hardly an inflection of the physical performance which doesn't surprise and enchant. So wonderful, for example, to see the brief shots of Judy as Juliet in her own adaptation of "Romeo and Juliet". Pickford's grace and authority not only suggest the artist Judy will become, but also evoke the physical aura of a great stage star, who knows how to make an entrance doing nothing in particular and rivet all eyes to herself. And I loved the moment when Judy gets her rejection letter from the publisher. She leans her head tragically against a fence-post, her body limp with grief - then she dashes the letter to the ground and stomps on it. All played in long shot. There isn't an actor in movies today who would have the guts, or the craft, to play such a moment so far from the camera. I watched the film with some wistfulness, since it was the last of the current Pickford releases I hadn't seen, and also with some trepidation, since it would be my first encounter with the music of Maria Newman, whose silent film scores are the subject of much controversy among silent film fans. The music she wrote for this film consequently took me by surprise, because it was one of the loveliest silent film scores I've ever heard . . . not only melodic, but downright lyrical, frankly emotional and scrupulously attentive to the pace and tone of the film. Perhaps it didn't evoke the atmosphere of a silent picture palace but it was hardly anachronistic in any kind of aggressive way - compared to the music of Charles Ives, most of which was written before 1915, Newman's score was a model of drawing-room propriety. My other favorite score among the current Pickford releases, the one Monte Alto did for "Amarilly", may use a different approach, weaving together strictly period pieces, but both scores have a propulsiveness and thoughtfulness and zest that perfectly echo the joyous inventiveness of Neilan and his star. The bad news is that there really is some sort of mastering problem with the DVD (transferred from a mostly gorgeous print) - a sort of insistent jerkiness in the frame advance, more obvious at some times than at others. It actually gave me a slight headache to watch, and also broke my heart, since this is one of the most amazing physical performances I've seen by Pickford, and it's not helped by the addition of digital hitches - which is sort of like kicking Fred Astaire while he's dancing. I hope the powers that be will issue a corrected version someday - because this film is one of the real treasures of American cinema - but I also hope they won't change a note of the Newman score. I still have a lot of Pickford to discover, and perhaps they released the best of it first, but I've been genuinely awed by what I've seen. All the histories tell us what a great celebrity she was, what an icon she was, what a shrewd businesswoman she was. And many observers have written powerfully about what she meant to them emotionally. But in the end, until you see the films, you're left with just a hair-do and a nickname - "America's Sweetheart" . . . which places her at the center of a nation's affections, but not necessarily at the center of its most vital art form, which is where she belongs. copyright 2001 by Lloyd Fonvielle, all rights reserved.